Finding a place for your little ones to play that’s both engaging and safe is a little hard to find! Which is why a place like Winkyboo is very welcome, cosy, well manned, large and full of activities. both a physical workout and creative expression in children. And in all this play they also get to interact with peers! There are plenty of attendants for the kids so you don’t have to be there during play time though parents and guardians are most welcome to stay. 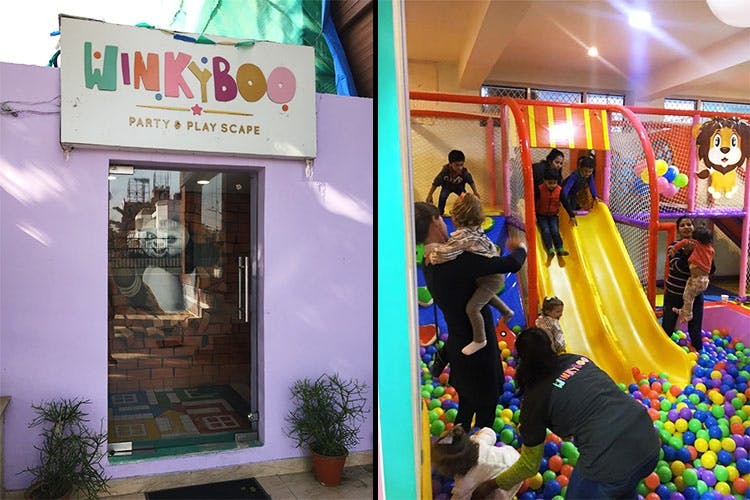 Winkyboo can also be booked for private events and birthday parties and considering your child is going to love the place, they’re probably going to want to cut their cake here. They also have interactive sessions like book reading, storytelling etc. They have a tie up with Gaatha Company and these sessions include, crafts, decorations, plays along with songs and dance. chicken nuggets which are only made on special request. activities and creatively stimulating too!